Class 7 Dangerous Goods are not covered in this course. Anybody who handles, offers for transport or transports dangerous goods requires TDG training. The TDG Regulations are a set of rules set out by Transport Canada that prescribe safety standards and shipping requirements for thousands of different dangerous goods. The Regulations also provide a means of communicating the nature and level of danger associated with chemicals. These courses cover the regulations for ground transport within Canada and are based on an employee's job function. Upon successful completion, a 3 year TDG Certificate is generated and emailed to the Training Administrator, along with a Performance Record. What is the difference between the All Workers, Drivers and Shippers/Receivers version of the course? When activating a course the Training Administrator can assign the trainee to one of the following TDG courses. TDG for Drivers: TDG for Drivers is a proven effective online course designed specifically for drivers who transport dangerous goods. The course fulfills the general training requirements for drivers as established by Transport Canada. Clear and concise animations and exercises help to illustrate each concept. TDG for Shippers/Receivers: Dealing with topics specific to both shippers and receivers, this course complies with Transport Canada's general TDG training requirements for ground shipments and incorporates audio, illustrations, animations and exercises for optimal learning. Suitable for shippers / receivers, freight handlers, dock workers, loaders and warehouse workers. TDG for All Workers: A combination of the above two courses, this complete course is designed for supervisors, managers, drivers, handlers and shippers / receivers who need to understand the TDG regulations. The course fulfills general training requirements established by Transport Canada for ground shipments and teaches the trainee how to be in compliance with the TDG Regulations and consequently avoid fines for non-compliance. 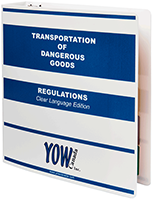 If you have questions regarding the TDG regulations, training or specific products, please contact us: 1.866.688.2845 or info@yowcanada.com.